In our seventh issue, the Bed and Breakfast Traveller takes you to Drumheller, Alberta. Located in the heart of the Canadian Badlands, Drumheller offers a unique and exciting blend of the distant past and promising future: its Dinosaur Trail, Royal Tyrrell Museum of Palaeontology, historic Horse Thief Canyon, and Hoodoo Trail combine with the generous hospitality and conveniences of the present. The Drumheller Valley is frequently referred to as an "outdoors place", and it only takes one visit to this breathtakingly beautiful area of Alberta to appreciate why. The landscape in some sections is continually eroding and exposing millions' of years' worth of geological history. The Dinosaur Trail, a 48 km route which encircles the town, includes not only a spectacular view of the badlands but such unique sights as the Bleriot Ferry, one of the last remaining cable-operated ferries, and Midland Provincial Park. Another popular destination is the Hoodoo Trail, whose route takes you through a handful of small communities whose roots are in Drumheller's coal mining days. It contains the Historic Atlas Coal Mine, now a historic site, which has the last standing ore sorting tipple of its make in Canada. Exploring this trail also takes you to the Rosedale Suspension Bridge, built in 1931. 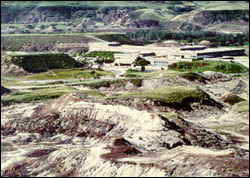 In terms of outdoor activities, Drumheller offers golf, downhill and cross-country skiing, swimming, boating, hiking, and more. 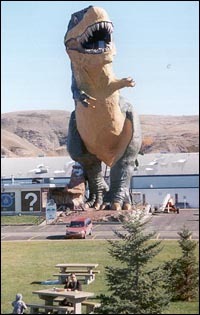 Going into town, it's hard to miss the reason why Drumheller is called "The Dinosaur Capital of the World": an 80 foot tall statue of an imposing T-Rex stands waiting for visitors to climb into its mouth- which doubles as a viewing platform for an amazing survey of the Drumheller Valley. The Royal Tyrrell Museum of Palaeontology presents dinosaur skeletons in remarkable displays, as well as prehistoric gardens, audio and video presentations, and the Burgess Shale Exhibit- a three dimensional look at unusual, prehistoric water creatures. Reptile World at 1222 Hwy 9 features over 85 reptile species, and even a hands-on experience for more daring visitors. July 11-22- Kaleidoscope Theatre's Summer Musical "Joseph and the Amazing Technicolor Dreamcoat". For more info call 1-403-823-6113. July 15 - Coal Miner's Day in East Coulee, 10:00 am to 6:00 pm. Featuring Tom Wilson and other entertainment. For more info call 1-403-823-6113. July 20-22- (in Rumsey) Sports Days, with fiddlers, parade, ball games, and races for kids. August 26 - Canadian Badlands Jamboree at Amphitheatre.